Mangy is just as obsessed with pies as he is with cakes. Frankly I was a little tired of the usual pepper steak pie. So I thought I’d give it a little twist. This recipe is loosely based on this one. The idea was so hard to resist, it seemed so exotic and rich. I would happily serve it as a stew with some bread or mash or over some couscous. I do use a pie-maker. I normally use puff pastry for the top and bottom when using a pie maker. This time I went a little fancy and used shortcrust for the bottoms. The end result was a lovely crisp bottom (who doesn’t like a nice bottom?) and a flaky puffy top. In a pressure cooker, add about 3 tablespoons of oil. Add cinnamon and bay leaves. Once fragrant, add onions and garlic. Add salt and sugar and stir well. Cook on low heat until sweet and tender. If the onions start to brown too much, add a little water to de-glaze the pot. While the onion is cooking, in another saucepan, add enough oil to pan fry. Add 2 tablespoons harissa to the beef cubes and stir well. Dust the beef cubes in the plain flour and then fry the beef in batches in the oil. Just brown the outside, don’t worry about cooking through. Add the beef to the pressure cooker. Stir well. Once the onions are soft add chicken stock powder. Then add wine. Add all other ingredients in (a), stir well. Cook until the wine has reduced slightly. Put the lid on and pressure cook until meat is tender (follow manufacturer’s instructions). Once cooked, remove lid and continue to simmer until gravy thickens. Remove and let cool slightly. Follow manufacturer’s instructions of your piemaker and prepare pastry for top and bottom. 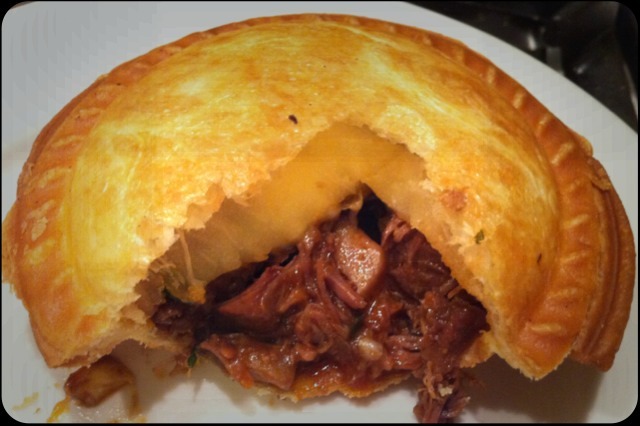 Fill pies with beef gravy, be careful not to over fill. Before closing pie with top pastry, add about 1 tablespoon of cheese into each pie. Follow manufacturer’s instructions and cook pies in piemaker, serve hot. Enjoy!